It's not a bib. It's a Tidy Top! This new stylish dining wear is perfect for the challenged diner in your life. These tops are very different from the standard white terry cloth bibs that have been used for years. Whether it be a senior or special needs child, this dining accessory will keep them looking good and save you hours of clean up and laundry. 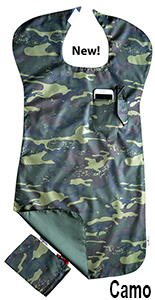 You actually get two bibs in one since each bib is reversible with one side showing a pattern and the other a matching solid color. Tidy Tops are stain and water proof. Their amazing fabric is soft, lightweight and elegant. Stains wipe off easily. Tidy Tops are extremely durable. These tops will stand up to commercial washing and will not shrink or run. 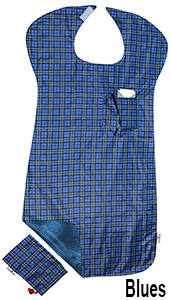 On each side of the Tidy Top, there is a pocket that can be used to hold glasses, tissues or cell phones while eating. Tidy Tops fold compactly into their free matching tote-bag, so that they can be easily taken along in a purse, wheelchair or glove compartment. Tidy Tops can be used in any situation where clothes need to stay clean such as art class, messy crafts, or just eating or drinking in a car. Tidy Tops fasten with Velcro so they are easy to take on and off. Available in 6 beautiful patterns shown below. Approx. dimensions top to bottom 15 - 17 inches wide, 34 inches long. Guaranteed to make meal times a lot less stressful.